Heavy metal often gets a bad rap. While it’s certainly the black sheep of most mainstream music genres, writing a metal song involves more than just down-tuned guitars and unintelligible grunting. The best songwriters know that a truly great heavy metal tune can be as catchy as any pop song, or as somber as the most soulful ballad – all while being heavy, of course. Don’t believe us? 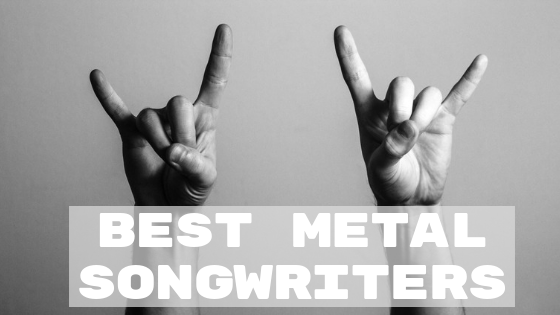 Here are ten of the best songwriters who have made their careers writing heavy metal songs. Mustaine pioneered the thrash metal movement of the ’80s in the band Metallica, but it wasn’t until his firing from that band that he truly made his mark on the metal world. He formed Megadeth to retaliate against his former bandmates, to write songs that were faster, bigger, and badder than his peers. While there’s no doubt that Metallica became the biggest, Megadeth’s 1990 album Rust in Peace is considered a heavy metal must-have, forever cementing the guitarist, singer, and songwriter as a legend. Florida-based Savatage enjoyed moderate success in the ’80s with their bombastic guitar and piano-driven style. But it wasn’t until songwriters Paul O’Neill and Robert Kinkel collaborated with the band that they achieved more mainstream success. The band’s earlier experience with writing rock operas paid off once they penned the now-ubiquitous holiday season staple, “Sarajevo (Christmas Eve 12/24)”, a song that single-handedly inspired the Christmas rock juggernaut Trans-Siberian Orchestra. This Texas quartet’s groove-heavy style is still being aped today. But while there’s no shortage of opening bands influenced by them, only the original had that special something… until they broke up. But while Dime’s whammy-pedal wailing and Phil’s grating screech are often imitated, Pantera proved it was more than the sum of its parts. When the band members did work together, they wrote truly headbanging classics like “Cemetery Gates”, “I’m Broken”, and “Walk”. Iron Maiden is one of heavy metal’s best-loved bands, and much of that adoration is attributed to their sprawling catalogue of quality material. Although Steve Harris, the band’s energetic bassist, is still considered to be Maiden’s primary songwriter, guitarist Adrian Smith and vocalist Bruce Dickinson can be credited with a handful of their most popular songs. Need inspiration? Look no further than “2 Minutes to Midnight”, “Wasted Years”, and “Powerslave”. System of a Down’s meteoric rise in popularity can be traced back to the release of their sophomore album, Toxicity. Both Tankian and Malakian put their talents together as skilled music and lyric writers, contributing to hits like “Chop Suey!” and “Aerials”, songs which weave heavy metal, Armenian folk music, and a number of other seemingly disparate elements into a truly unique listening experience. The late Chuck Schuldiner is now known as the godfather of death metal. Early material from his appropriately named band Death was every bit as aggressive as you’d imagine. And while he could have continued channeling the primeval ferocity of early Death albums like Leprosy and Scream Bloody Gore long into his career, Schuldiner’s arguably greatest works were his later ones. The vocalist, guitarist, and songwriter pushed his songwriting skills far beyond the progressive and technical envelope of the time. Sadly, brain cancer claimed the young musician’s life at the age of 34, leaving behind a musical legacy for all things heavy metal. Queensryche stood out from many of their heavy metal peers of the 1980s thanks to the combined songwriting abilities of guitarists Chris DeGarmo and Michael Wilton and singer Geoff Tate. The trio’s uncanny ability to write poppy, sing-a-long hooks – all while retaining a decidedly edgy execution and tone – led to classic albums such as Operation: Mindcrime and Empire. Devin Townsend, sometimes known as “Hevy Devy,” is a prolific multi-instrumentalist. His career began as a vocalist for guitar virtuoso Steve Vai, and since then he has branched out into a number of his own bands. His abilities as a vocalist and lead guitarist are matched only by his ability to explore a diverse range of styles across his many musical projects, from driving industrial and caustic death metal to heartfelt acoustic rock. Inarguably the most popular metal band in the world (“metal” is in their band name, after all), Metallica is responsible for some of the genre’s best-known songs: “Enter Sandman”, “One”, and “Master of Puppets” to name a few. It’s a testament to the chemistry of the core songwriting duo of Hetfield and Ulrich that they’ve built themselves into a household name and are still writing and performing after so many years. Whether you’re looking to write songs with a hard edge or are just seeking to blow off some steam via musical expression, any one of heavy metal’s top songwriters has a catalog of material to inspire and push your abilities. Give some of their songs a spin, then try heavy metal songwriting for yourself!